Conneect to the test socket with filter to see if speeds improve. Do a quiet line test 17070 option 2 any noise report a line fault on 151, don't mention broadband. New check due to lacking cabinet and exchange info. Looks like DLM has banded your line at 40M due to instability. Have you been experiencing drop outs or hub restarts? Or your line has been mis-provisioned at 40M download. I had some drops for last week, but now it seems stable. 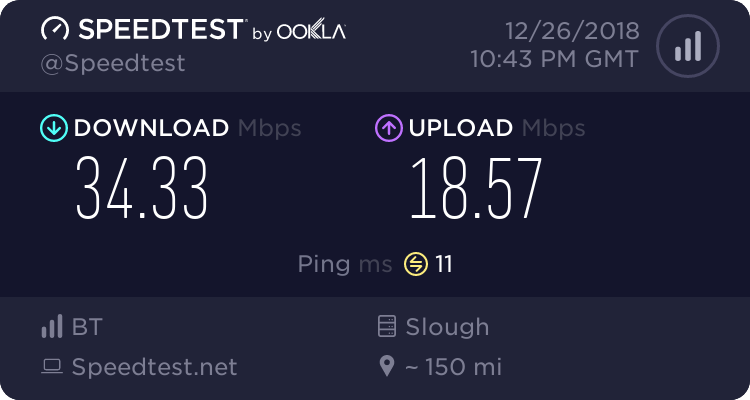 Keep a stable connection and DLM should restore your speed, might take weeks rather than days though. Don't be tempted to reboot your hub. Thank you, I'll keep an eye on it for the next few weeks then. After raising few faults and having some conversations with customer service I'm unable to see any improvements. After few weeks I'm experiencing even lower speeds then before. Can you repost your hub stats?